Europe is a diverse and a beautiful place and taking a train lets you see the wonderfully varying country side. If you were just to take planes, generally you would only be inside the city spaces. Really that would be a shame considering the magical quality that rural Europe has. Beyond that too, it gives a city that you are going a better build up when you see the country side that is leading up to it. Might even be a better option if the opportunity were to afford to it would be to rent a car and drive in Europe, but minus that possibility a plane suffices. 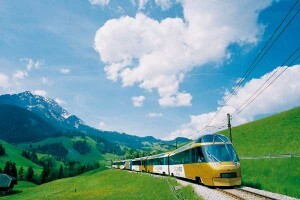 Often travelers in Europe will purchase an inter rail or Euro rail ticket that allows them unlimited chances to jump on and off trains for a set amount of time. The benefit of having a ticket like this is that it encourages the traveler to see more cities and places in Europe. When you are moving just by plane, be it on one of the low cost carriers like Ryan Air or Easy Jet, the cost of each flight generally leads to going to one, perhaps two destinations. Jumping on and off the train is assured to get a person seeing more of Europe and when combined with the first point above also seeing more of the country side that makes the continent special. The last point about the benefit of a train is that often people in trains sit in carriages that house about 6 – 8 people in them. As people get to choose their carriage you often can sit near people you own age. What ends up happening is that the train becomes a great place to make connections with other people. Sometimes you can even decide to look for a hostel together and end up looking around the city. The length of the ride and the intimacy of the carriages make it easier to chat with people over plane rides, especially short flights like most of the flights in Europe are.